Using reclaimed barn doors in the bedroom is well worth the effort. 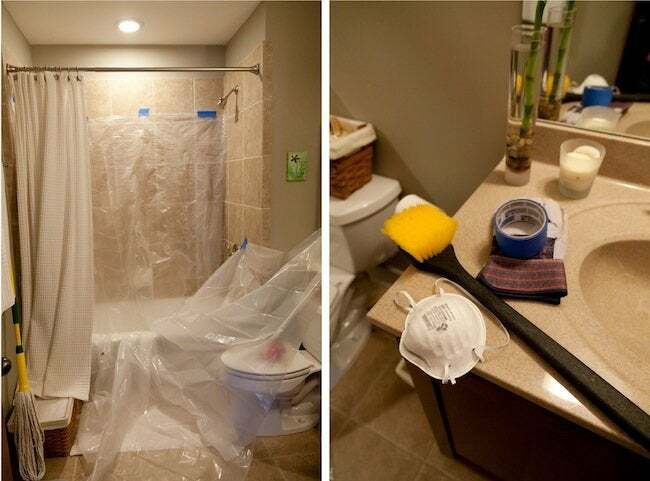 At BobVila.com we like resourcefulness. And we love reclaimed wood. 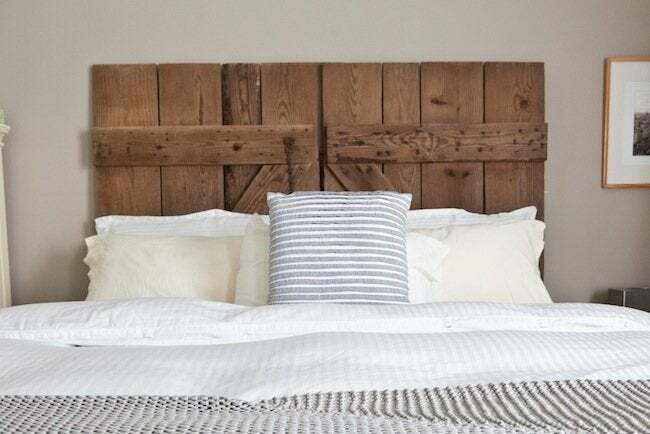 So when we saw this salvaged barn door headboard from Sabrina at Sweet French Toast, we wanted it to give it a big Bob Vila Thumbs Up. What started out as a fortuitous Craigslist find was transformed into an incredible DIY headboard. And for anyone afraid of the potential pests, dirt, or splinters that could come from using reclaimed wood, read on to see how Sabrina breaks down the process of making perfectly good materials look perfectly at home in a bedroom. After communicating with the listing owner, RH and I made the trek out to what I would call “the country” in Gainesville, north of the metro Atlanta area. The barn was an honest-to-goodness barn, complete with the charming stench of horse manure. 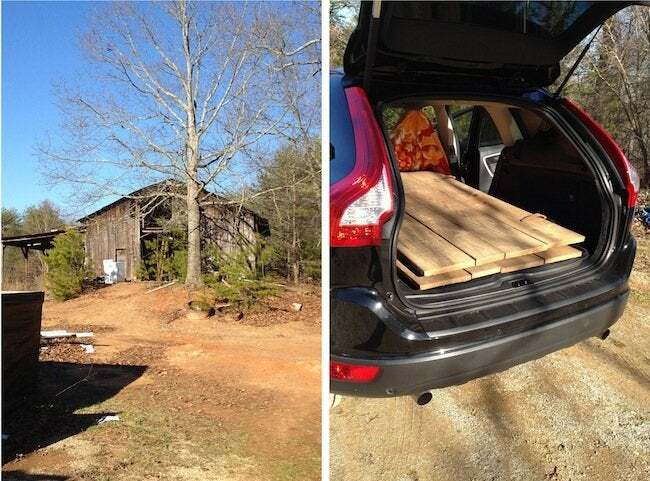 If you’re crazy to try this yourself, remember to determine how many doors you need, wear proper shoes, make sure the doors will fit in your car, and bring a friend—these doors are frequently solid wood, so they can be very heavy! I waited to clean the doors so I could work outside during daylight. Because I live in a loft-condo, I’m very limited in the options I have for cleaning large items like these doors. Some of the info I read suggested using a pressure washer to wash barn wood clean. That might have worked, but I would have been worried about damaging the wood and metal hinges. I didn’t even access to a hose, much less a pressure washer. Instead, I used two 5-gallon buckets and a 20″ gong brush out on my little patio. I would have preferred to have had a hose and nozzle sprayer to wash down the doors. I’m sure the people walking by my place that day wondered what the heck I was up to! I filled the first bucket with warm water and a mild detergent and the second bucket with clean warm water. I dipped the brush into the soapy water and began scrubbing the doors down, alternating every now and then with clean water to rinse off the soap and dirt. It took me a couple of hours to scrub down the barn wood board and both doors, front and back. I replaced the water in both buckets halfway through when it became too dirty. Then, I propped them up outside to let them dry. After a few hours of drying, I brought them inside overnight. While I’m sure Timmy Termite and Paul the Powder Post Beetle would love to join us for dinner sometime, I knew I had to do something to make sure a host of creepy crawlies didn’t infiltrate our place. This is the subject that I spent the most time reading about. There are many options for treating unfinished wood, including commercial products like Boracare and Timbor, but I didn’t feel comfortable using them on a headboard—which would be very close to our heads every night—especially since the homebrew version of Boracare contains antifreeze. Besides that, Boracare is pretty pricey. The day after scrubbing the doors and board clean, I decided to treat the wood using a Borax solution. 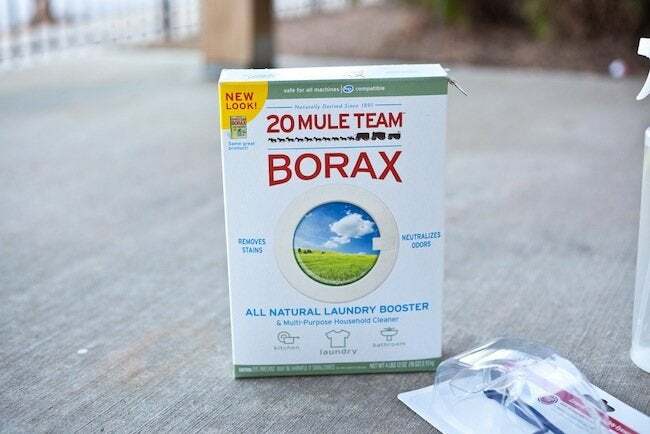 I mixed 3 cups of Borax into 1 gallon of warm water and stirred to dissolve as much of it as possible. Using latex gloves and a sponge, I coated the surface of the wood, making sure to cover every exposed piece of the doors I could reach—front, back, top and bottom. Theoretically, any pests in the wood will either dry out or eat the borate in the wood and die. I am counting on this working! After treating the wood with the Borax solution, I let the doors and board dry all day outside and then for another six days inside since I had to wait for another weekend to continue the process. I figured this was plenty of time for the wood to dry thoroughly and also to acclimate to the temperature/humidity inside our place. As the wood dried, little crystals of Borax began to form on the surface. My plan was to lay out a huge plastic drop cloth on my patio, move the doors back outside, and brush the crystals off. This weekend was insanely windy though, and I was worried about the crystals flying into my hair and my eyes, even though I am a safety nerd and wear the oh-so-stylish safety goggles and dust mask while I work. So, I covered the guest bathroom with the plastic drop cloth and brushed down the wood board in the tub. Then I realized that there was no way the barn doors were going to make it into the guest bath tub gracefully, so I moved the drop cloth and set up a little work area in the living room. I don’t have any photos of that, but it seriously looked like a HazMat area with everything covered in plastic and me waving around my gong brush while decked out in goggles and a face mask. I brushed down the doors, with the key word being brushed down. Downward strokes ensured that the crystals and any remaining dirt fell down onto the drop cloth instead of flying through the air. I vacuumed the drop cloth with my DustBuster a few times while I was working, and when every surface of the doors had been brushed, I rolled up the drop cloth and stuffed it into a garbage bag. If I wanted to stain the wood, I would have done that after thoroughly cleaning the wood from the Borax treatment. I decided to leave the wood natural and unfinished though. With the doors in good shape, it was time to assemble the headboard! I tried various configurations (the “Z” facing the wall, facing out, hinges open, hinges closed) before RH helped me find the winning look. The doors are a little crooked, so I placed a single barn wood board behind the middle of the headboard, where the two doors should meet and instead leave a rather large gap. The true test came when I moved the decorative pillows that were leaning up against the doors. Since they are white, I honestly expected them to show at least a little red dirt, but they were spotless! Thanks, Sabrina! 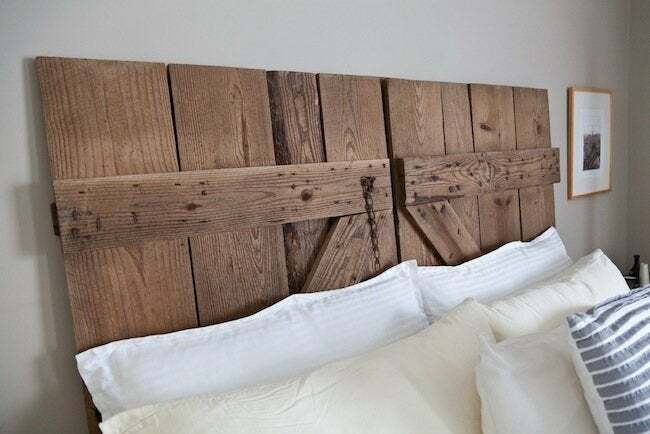 To see even more details from her DIY barn door headboard, or check out her other DIY projects, visit Sweet French Toast.